Be the first to share your favorite memory, photo or story of Malcolm . This memorial page is dedicated for family, friends and future generations to celebrate the life of their loved one. 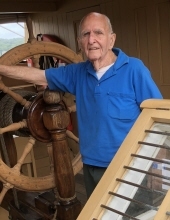 GRISWOLD – Malcolm Griswold, 88, passed away on Sunday, January 20, 2019. He was the loving husband of the late Gertrude (Beeman) Thibault. Born April 8, 1930 in Winsted; the son of the late John and Mary (Inches) Griswold. Malc proudly served in the U.S. Navy during the Korean Conflict. He was a dedicated hard worker who worked for the State of CT for 36 years as a Mechanic then Seitz Corp for 4 years and Agway for 3 years. He loved to travel especially to Hawaii and special trips with his closest granddaughter and great grandsons. He enjoyed history museums, was an amazing role model with a kind soul. He is survived by three brothers, Gordon Griswold of Barkhamsted, Douglas Griswold and George Griswold, both of Winchester; daughter in law Patricia Thibault of West Cornwall, cherished granddaughter, Jeanine Thibault of Winsted; beloved great grandsons, Joseph and Antonio Santoro, both of Winsted; grandchildren Tony, Cheryl, James, Mark, Steven, Scott and Kristine Thibault and several great grandchildren, his devoted niece Bonnie (Griswold) Pederson and several nieces and nephews. He also leaves his dog, Lo. He was predeceased by a daughter, Theresa Gregg, stepsons’ Antonio, Frederick and Michael Thibault, daughter-in law Jeannette (Ferrentino) Thibault and brothers, Frederick Harper Griswold and Marshall Victor Griswold. Friends may call on Saturday, February 2, 2019 at Montano-Shea Funeral Home, 922 Main Street, Winsted from 11 – 12 PM with a funeral service at noon. Burial will be held in West Cornwall in the spring with full Military Honors. Visit an online guestbook at montano-shea.com. To plant a tree in memory of Malcolm Griswold, please visit our Tribute Store. "Email Address" would like to share the life celebration of Malcolm Griswold. Click on the "link" to go to share a favorite memory or leave a condolence message for the family.